The Wesleyan Covenant Association is pleased to announce that Bishop Kasap Owan will preach and celebrate Holy Communion at its Third Global Gathering at Mt. Bethel United Methodist Church in Marietta, Georgia on Saturday, November 3, 2018. Bishop Owan will lead the closing worship at the WCA’s Third Global Gathering. He will deliver a brief message and then lead in the celebration of Holy Communion as the host and simulcast sites conclude the gathering under the theme Unashamed! Bishop Owan presides over the South Congo Episcopal Area, a vast geographical region that encompasses the Lukoshi, Northwest Katanga, South Congo, and Southwest Katanga Annual Conferences, and also the neighboring Zambia Annual Conference. Total United Methodist membership in Bishop Owan’s episcopal area is approximately 1.1 million making it one of largest episcopal areas in the entire church. By comparison, its membership is three times the size of the North Georgia Annual Conference, the largest in the U.S. 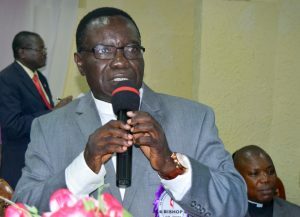 Prior to his election as a bishop in March 2017, Owan served as president of the Katanga Methodist University in Mulungushi, Democratic Republic of Congo. He was also a founding member and organizer of the Africa Initiative, a coalition of lay and clergy African General Conference delegates throughout the continent. Bishop Owan attended Mulungushi Theological College and he holds Masters and Doctoral degrees in theological studies. According to a United Methodist News Service article by Eveline Chikwanah, his wife passed away in 2014. He has a daughter and three sons.